Oven Cleaning Experts in Redcliffe SW5 | RDA Cleaning & Maintenance Ltd. Trying to renew your previous desire to live healthy, which involves healthy domestic food? Don't forget to clean the oven in a natural way, then. Try the organic and smart expert oven cleaning service in Redcliffe SW5 our company has designed for you! The burnt out stains and the greasy surface should be in past, because the oven must be shiny and healthy! Rely on the diligent and experienced oven cleaners. Call them in your house and let them show you how the innovative oven cleaning service works. Make an order for the service via this phone number 020 3404 1646 ! We are available for your questions and reservations 24/7! The well-known RDA Cleaning & Maintenance Ltd. is a reputable oven cleaners Redcliffe SW5 with 10 years of experience in the field. We have all the necessary knowledge and oven cleaning tools to give your oven a nice refreshing disinfection. We clean both - from the inside and from the outside. If needed, we also dismantle the device and re-assemble it back in the end. Degreasing and de-scaling are included in the service with no extra charging. The oven cleaners are very skilful in stain removal. They eliminate oily spots, burnt stains, leftover organic dirt and residues. Attention: all oven cleaning services are strictly executed with tested natural remedies. Your family is protected - chemicals are not involved in any of the sanitizing actions we do. After hard scrubbing, we rinse the stove parts carefully to give it a double protection. If required, we will also polish the oven surfaces gently and safely. 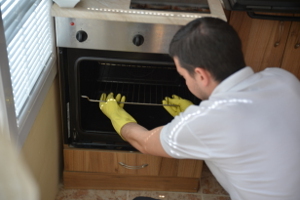 Hurry Up & Book A Trustworthy Oven Cleaning Company In Redcliffe SW5 Now! RDA Cleaning & Maintenance Ltd. is waiting for your orders and calls for more additional information on this phone number 020 3404 1646! Get a free quote now and you can receive quality oven cleaning service in Redcliffe SW5 by the end of the day.